I draw too tightly. Always have. Way too much consideration to making something that looks nice, rather than trying to capture a great idea. That’s why I’ve started drawing these little pen and pencil doodles lately, and it’s why I gave the Copic Markers another go. Throwing in a really broad shape with the markers makes you forget about trying to create something beautiful, it’s about creating a cool shape, or an interesting form. 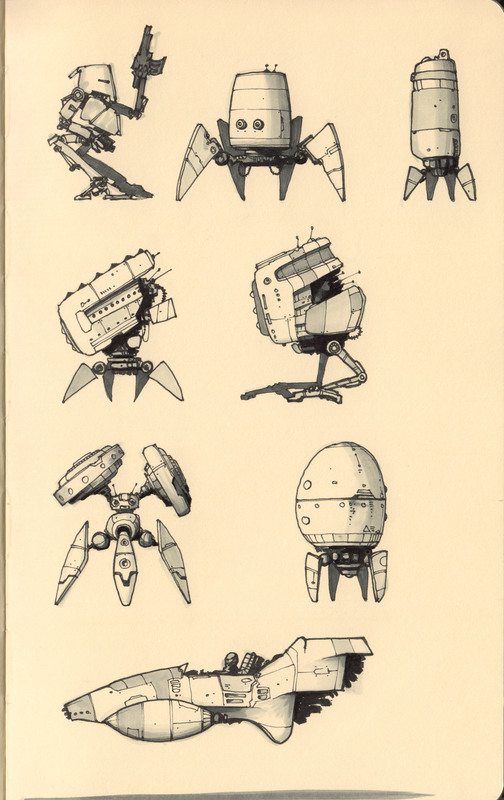 Picking up a pigment liner and then trying to discover the shapes is great fun, and it’s a pretty quick way to work. 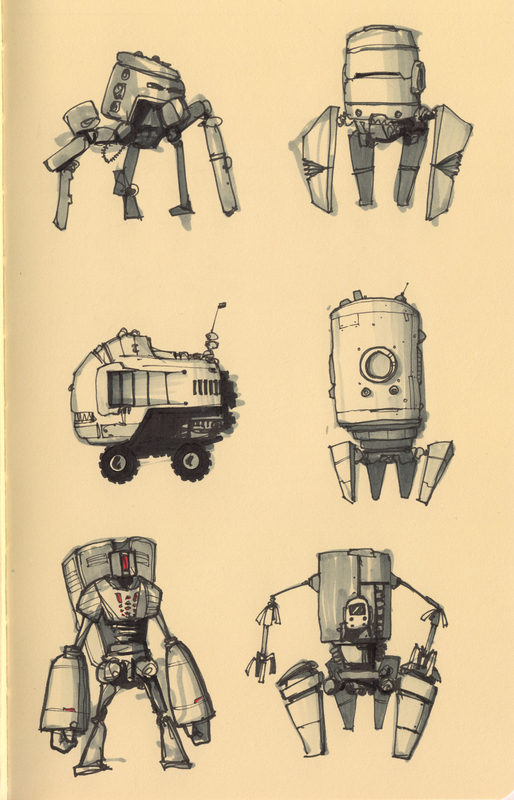 Each mech takes between five and ten minutes. 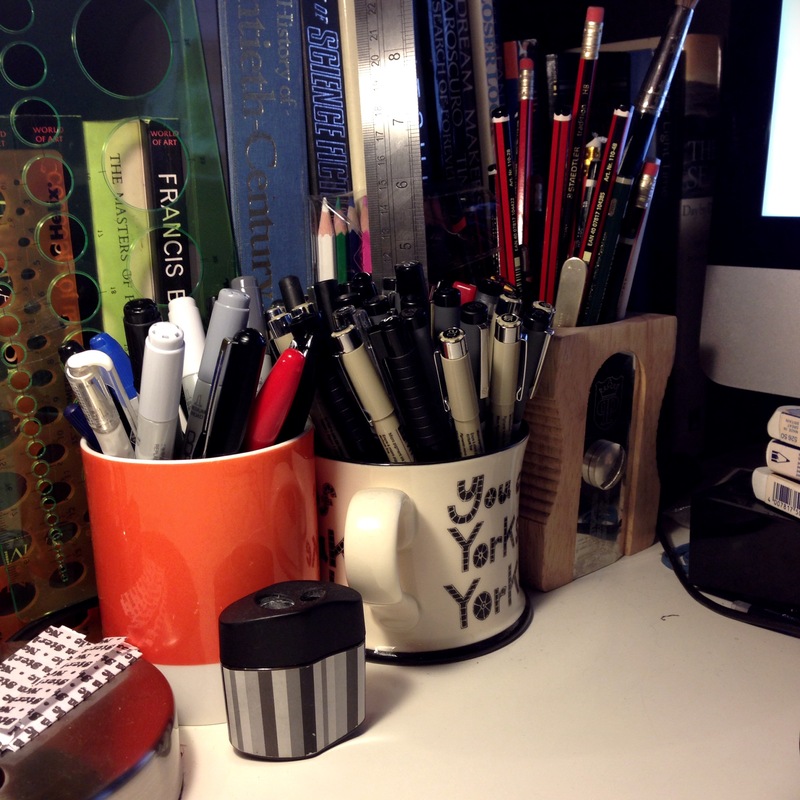 The photo above shows my mugs full of pens. Copic markers, and a few Sharpies in the first mug – along with a white gel pen, and a Pentel Pocket Brush. Sakura Pigma Microns, Staedtler Pigment Liners and a few Faber Castells in the second mug, and a bunch of pencils in the last – along with a brush for removing erasing bits, and a scalpel for sharpening. There are a few ellipse and circle guides behind, with a metal ruler and a few coloured pencils. And that last picture? 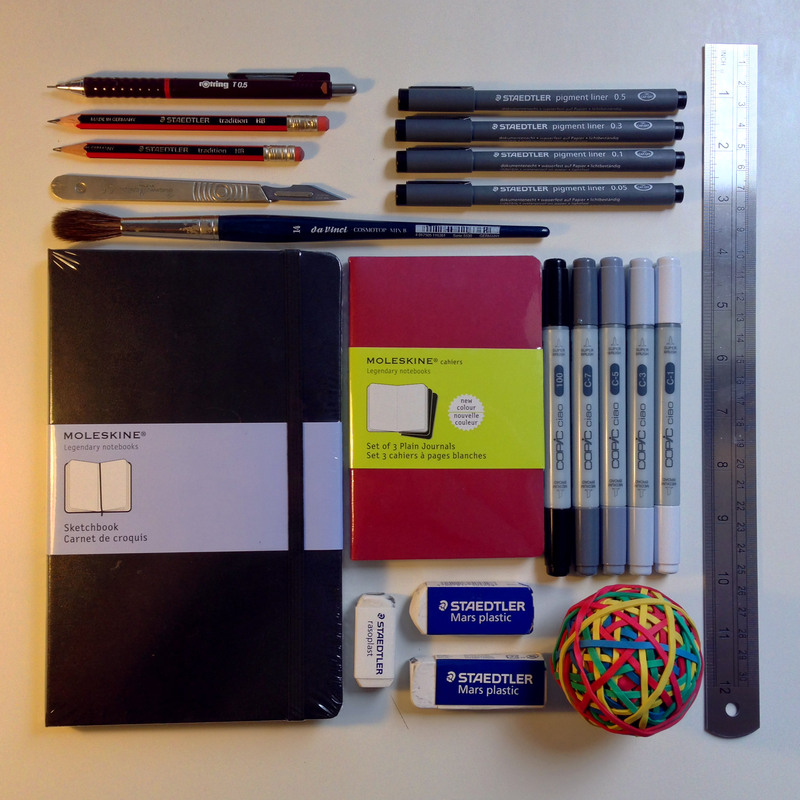 Well my OCD just shines through… Those are some of my most used bits and pieces. I love your your sketches. I discovered your work on Instagram from March of Robots. I like your style- simple, not overly complicated, interesting designs. I recently got back into drawing and wasn’t sure what other tools to use aside from what I’m comfortable with- microns, pencil, colored pencils. Your list of markers, pens and other materials was very helpful. I look forward to getting some and putting them to use. Thanks for sharing. Can’t wait to see what you draw next! I really relate to this. I ask myself “What does good look like?” If I could draw just one drawing, paint just one painting…..or how would I fill a million empty pages or empty canvases? The task is to be completely original somehow whilst putting my entire life, learning and experience through a crucible of my own design. It should come easily or look like it happened easily. Or it should be done with great difficulty until the impossible is habitual. Or something. One question, can you tell me what paper you use for sketching?